GTA 5 cheats for PC can make your adventures in Los Santos explosive – quite literally so if you use the explosive ammo cheat. By using a variety of console commands you can add some really cool effects to the game, including invincibility and moon-style gravity. The best thing about its list of cheats is that they can be used to transform the game completely – the aforementioned moon gravity being a fine case in point – or just to take the edge off those tougher missions by replenishing your health, armour, and ammo. You know – just for a treat. If you’re embarking on your 90th playthrough, some time-saving options like the Usain Bolt-style fast running are also pretty handy. And, crikey, if that wasn’t enough, we’ve got codes below that’ll help those who just want to use GTA V as a virtual photography project – pop out your smartphone and you can manipulate the time of day, weather settings, and more. We have the codes you need right here, so read on for all the best GTA V cheats. Love doing your own thing? Go crazy in the best sandbox games on PC. 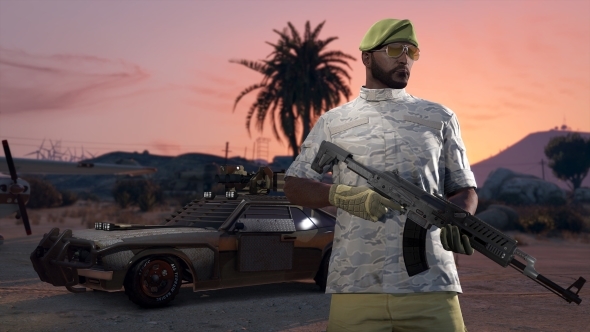 OK, so first thing’s first: there is no GTA 5 PC money cheat. Sorry folks, it is not the GTA 3 era any more. However, that doesn’t mean there is no easy way to make money in GTA 5. There are a couple of sunken wrecks off the coast of the map that contain hidden items worth a tonne of cash. Simply grab those a few times over and you can make as much money as you want. The first wreckage is just off the coast of Paleto Bay, which is the beach area to the very north of the map, in Blaine County. You will notice at the bottom of the beach area there is a section of sand that juts out like a finger; dive down around here and you should find a wreckage containing glowing briefcases, each worth $12,000. One is close to the sunken airplane, while the other is on the wreckage by an open hatch. The second location is off the coast of Del Perro, the Santa Monica-style beach section with the funfair pier. Head a little further up the coast to where the beach thins out, and then swim out to sea. In this wreckage you will find glowing briefcases worth $25,000 each. Easy money! If you are looking for GTA 5 PC cheats, then you have come to the right place. Below is a list of cool cheats you can activate for a variety of effects, from slowing down the speed of the game to turning your character invincible. To make GTA 5 PC cheats work, you need to activate the console with the ~ key, located below the Esc button on your keyboard. This will display a pop-up window on your screen where you can type the console command for the cheat you want to use. Alternatively you can key a number into your character’s cell phone, which is useful if you are playing with a controller instead of a keyboard. Engage god mode and shrug off all damage with this GTA 5 cheat. It works for five minutes, so don’t forget to re-activate it regularly. The title says it all: top up your health and armour points and stay in the fight. Recharges your character’s special ability. Take a single star off your wanted level. Use multiple times if you’ve been a bad person. Increase the heat. Attract the law to your position with some wanted stars. Equip yourself with every weapon in the game, plus a bunch of ammunition. Turn every bullet into a mini missile with explosive ammunition. Set enemies ablaze with these flaming bullets. Slows down time while aiming. Enter up to four times for increased effect. Fifth use cancels the cheat. Slow down the speed of the whole game. Use this GTA 5 cheat up to three times for increased effect, or four times to disable it. Makes your character stumble around as if drunk. Run like Usain Bolt with this speed cheat. Become an ocean predator with faster swim speeds. Your melee attacks cause explosions. Perfect for when a knock-out just isn’t enough. Not the Bond movie you remember. Spawns you in mid-air for a free fall. Remember to pack a parachute. In sudden need of a parachute? Simply activate this GTA 5 cheat. Leap over buildings by putting a super spring in your step. Hold spacebar for higher jumps. Use this GTA V cheat to rotate between sunny, clear, cloudy, smoggy, overcast, rainy, thundery, clearing, and snowing weather types. Play the game as any character or NPC. Adjusts the physics of the game to make it feel like you are on the moon while driving. Make your car drift and slide without the need for the handbrake.